There's snow on them thar hills!! Thousands of years ago, when the Aztec Empire was in its heyday and dominated the Valley of Mexico, it was common practice to subject neighboring towns, and to require a mandatory tax. 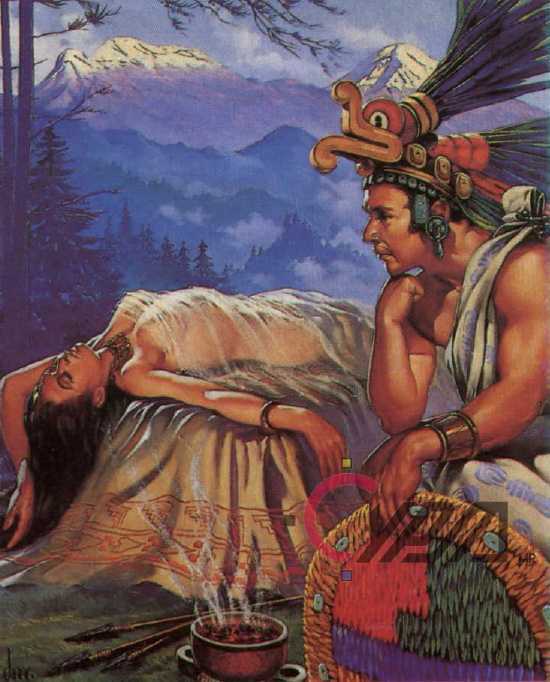 It was then that the chief of the Tlaxcaltecas, bitter enemies of the Aztecs, weary of this terrible oppression, decided to fight for his people’s freedom.The chief had a daughter named Iztaccihuatl: the most beautiful of all the princesses, who had professed her love for young Popocatepetl, one of her father’s people and the most handsome warrior. Both professed a deep love for each other, so before leaving for war, Popocatepetl asked the chief for the hand of Princess Iztaccihuatl.The father gladly agreed and promised to welcome him back with a big celebration to give him his daughter’s hand if he returned victorious from the battle.The brave warrior accepted, prepared everything and departed keeping in his heart the promise that the princess would be waiting for him to consummate their love.Soon afterward, a love rival of Popocatepetl, jealous of the love they professed to each other, told Princess Iztaccihuatl that her beloved had died in combat.Crushed by such tragedy and overwhelmed by sadness the princess died, without even imagining it could be a lie. Popocatepetl returned victorious to his people, hoping to find his beloved princess. Upon arrival, he received the terrible news of the death of Iztaccihuatl. Devastated by the news, he wandered about the streets for several days and nights, until he decided he had to do something to honor her love and to assure that the princess would not ever be forgotten. He ordered a great tomb built under the sun, piling up ten hills together to form a huge mountain. He carried the dead Princess in his arms, took her to the summit and laid her on the great mountain. The young warrior lovingly kissed her cold lips, took a smoking torch and knelt in front of his beloved to watch over her eternal sleep.From then on, they continue together, facing each other. Eventually the snow covered their bodies, forming two majestic volcanoes that would remain joined till the end of time. (Source). Both volcanoes lie not all that far from Mexico City and colin and I love seeing them as we fly into or out of the city, or travelling along towards Puebla when we head to Coatepec or back again. We made the trip from Coatepec to Mexico City on Sunday and never before have we seen such snow on both mountains! And certainly not in March! Oh photos--taken from the bus--don't do the sight they made any justice. It was heart-stoppingly beautiful. Having trouble with uploading... more pics to come!